The bloody fights of the ancient Roman gladiators are considered among the defining features of the Roman civilisation, despite the fact that these violent fights merely displayed the darker side of the Roman civilisation. Gladiators were the fighters who fought against each other and even against wild animals in the wide arenas or amphitheatres. Violent death was a common feature of these fights and yet thousands of people flocked to watch them. Most of the gladiators were slaves who did not have rights but some gladiators were also free people who freely chose to fight as gladiators. The ancient martial ethics of Rome were the main driving force behind the popularity of ancient Roman gladiators and their violent clashes. The history of the Roman gladiator games can be traced to funeral rites during the Punic Wars of the 3rd century BC. However, there is disagreement among historians about the exact origin of gladiatorial games. For instance, Roman historian Livy writes that these games first started in 310 BC by the Campanians in order to celebrate their victory over the Samnites. Whatever the actual origin, these games had become highly popular in ancient Rome by first century BC and reached their peak from 1st century BC to 2nd century AD. It was also during this time that the grand amphitheatres and arenas were made where the Roman gladiators fought in front of thousands of spectators. A retiarius gladiator using his net to ensnare his foe. With the widespread popularity of the gladiators and their fights, special training schools for gladiators began to be established. The first known school for the training of gladiators was established by Aurelius Scaurus at Capua around 105 BC. These schools were known as ‘ludus’ and the instructors held absolute authority over the gladiators training in these schools. The ancient Roman gladiators training in these schools were considered a family which was known as ‘familia gladiatoria’. The famous slave revolt led by Spartacus also originated in one of these training schools owned by Lentulus Batiatus. The city of Rome had four such schools known as Ludus Magnus which was the largest and most important with over 2,000 gladiators and the Ludus Dacicus, Ludus Gallicus, and Ludus Matutinus. The ancient Roman gladiators used a variety of armour types which sometimes also included foreign armour and weapons. There were various components of the complete armour of the gladiators. For instance, there were protective arm wraps made of leather and cloth known as manicae and used for arm and wrist padding. The sword belt was known as belteus while special protective leg padding worn below a greave was known as the fascia which just like the protective arm wraps and was also made of leather. Metal helmets used by the fighters were known as cassis while a single piece of metal used as breastplate was called a cuirass. Other components included in the armour of the ancient Roman gladiators including a shoulder guard known as a galerus, leg guard known as ocrea, and other smaller components. There were two main types of gladiator fights. These were lightly armed gladiator fights and heavily armed gladiator fights. The gladiators who fought in the lightly armed gladiator fights were called the Retiarii. These were lightly armoured fighters who used no helmets and carried no shields. While this resulted in less protection, it had an advantage of easy mobility and agility. Fights were often arranged between lightly armed and heavily armed gladiators of Rome. 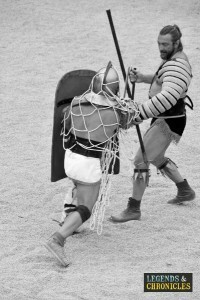 The heavily armed ancient Roman gladiators included various types such as gallus, samnites, secutores, and murmillones. They used helmets as well as all other components of the armour of Roman gladiators. Roman gladiators at battle, with a secutor gladiator making a stand. The famous Colosseum was the place in ancient Rome where the gladiators fought in addition to other public spectacles. The construction of the Colosseum was started under the reign of Emperor Vespasian in 72 AD and was completed during the reign of his successor and heir, Titus, in 80 AD. It had a capability of holding between 50,000 and 80,000 spectators at the same time. During the fights of ancient Roman gladiators, the emperor would usually be present. After the entry of the gladiators into the arena, they would salute the emperor shouting the ritual chorus ‘Ave imperato morituri te salutant!’ meaning ‘we who we are about to die, salute you!’ Before the Colosseum, ancient Roman gladiators fought to death but after the construction of the Colosseum, the losing gladiators could ask for mercy. Different kinds of ancient Roman gladiators fought in the Colosseum, including spear fighters, mounted bowmen, net fighters, shield gladiators, war-chariot gladiators, and others. The most famous of all the gladiators of Rome was Spartacus who famously led the gladiator rebellion against Rome but was eventually defeated and killed in 71 BC. The Legacy of Spartacus as a slave resisting against the oppressive rulers lives on in popular culture and literature. Not just slaves and ordinary people but various emperors were also gladiators in their own times. For instance, Emperor Commodus was a gladiator, although he never battled against serious ancient Roman gladiators and preferred fighting either injured gladiators or bound animals. Because of this he was not popular with the masses. Other famous gladiators include Flamma, Crixus, Carpophorus, Marcus Attilius, and others. The gladiators were physically agile fighters who indulged in bloody fights in front of thousands of spectators. 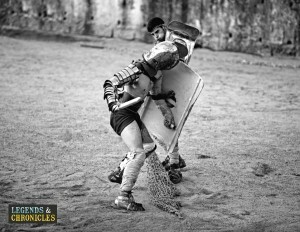 The practice of arranging the fights of ancient Roman gladiators emerged some time during the third century BC and by the first and second centuries AD it had reached at the peak of its fame. Not only the common slaves but many free people also fought as gladiators as it became financially rewarding profession. Various schools for the training of gladiators were established in ancient Rome and four such schools existed only in the city of Rome. Most of the gladiators were slaves and did not have any rights. During the early years of the gladiators fighting, the fighters were expected to fight till death but with the passage of time, and after the construction of the Colosseum, defeated gladiators could seek mercy from the emperor.